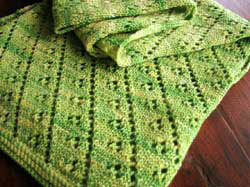 A light, airy scarf that uses a simple lace pattern and only one skein of Tosh Sock! This design is free from the Madelinetosh Website. US 1 or 2 needles are required and not included. Color Shown is Lettuce Leaf. $26.50 -- Kit price including yarn only (no book or pattern).